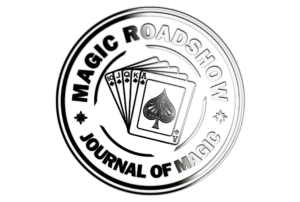 Welcome to the latest issue of The Magic Roadshow! As always, I’ve tried to put together something to help your magic journey.. without charging you a single penny. Actually, it cost me a pretty penny… but that’s another story for another day. There was a time when publishing and mailing on the internet was basically free. Those were the good ‘ol days for sure. Now, you have specific and complicated hoops to jump through.. or the internet troll will prevent your crossing the bridge, take your candy, throw you in the water, and make your day a miserable mess. I will be SO glad when this summer is history. I think the first day of Fall is this coming weekend, and I am cheering it along with all my might. I love the Fall. Some folks think the changing of the landscape is a little depressing.. but I look at it as a respite among the crisp autumn days and crystal clear nights. No Humidity! Praise the Lord !! I did see Greg Wilson lecture the night after I arrived home. That was an expensive treat.. well worth every dollar… lots of dollars… If you get a chance to see Greg.. do it. June 19, 2018 marked the 43 year anniversary of the death of one of the funniest magicians you’ve never heard of. The hysterical underground cult phenomena who went by the title of “senator”. When asked why he billed himself as “senator”, he said cantankerously “Because I talk too much and I rarely pass anything, and when I do it‘s usually gas. Anyway, I didn’t call myself “senator“, you did!” In a sub-culture dedicated to people doing strange and amazing things, Clarke Crandall stood out from the pack. In the world of magic, striving for mediocrity is a step up. Your average comedy magician is about as funny as communism. Some of them have acts that stink so bad that they attract more flies than audience members. The jokes told are more likely to induce cringing or pity than any kind of spontaneous laughter. There’s no such thing as setting the bar too low. Crandall’s act was something all together different. He was a skilled magician and could make amazing things with cards, rope, and dice happen right under your nose. He also happened to be insanely hilarious. The thing that makes Crandall so interesting as a performer is that hardly anyone can remember in vivid detail what his act even consisted of. Why? They were too busy laughing to pay that much attention to his tricks. Audience members recall tears welled up in their eyes and stomachs that hurt like menstrual cramps from the insane and hysterical performance.…making his audience that much easier to fool. The infamous magician and magic castle alumni was born April, 23 1907 on a farm in rural Iowa. Standing at 6’ 2”, wearing thick black- rimmed glasses, puffing on a surreal looking spiral cigar, and sporting a blatantly phony handlebar mustache, he resembled a lankier, and more dapper version of flamboyant movie critic Gene Shallit. Facts of his life are murky at best. Around the early 1940s Crandall was living in Chicago and working at the stockyards as a cattle buyer. The first time that he was on record for having performed in front of an appreciative audience was in 1947, at a Society of American magicians function. His dead pan observations, droll wit, and genuinely funny comic persona, that of a bawdy conjuring curmudgeon ,were already in place. crotch a gentle tap. “Watch your pecker, son.” he admonished the young Hayden nonchalantly finishing his performance with out a ruffle. Crandall quit working in the stockyards when he was offered the job of performing bartender at George Banning’s magic lounge in Cicero, Illinois. The town was famous for being Al Capone‘s retreat from Chicago when the heat was on. Banning’s was soon to be one of the premiere magic lounges’ popular in the Chicago area. Magic was a popular attraction in Chicago bars up until the late 1970‘s. Prevailing stage magicians of the day, Blackstone Jr., left a bad taste in the publics mouth, and good magicians lost like Doug Henning and Harry audiences from guilt by association. he used to quip) perform tricks like his dice stacking routine, in which four separate dice were placed in a giant cup. After the dice were shaken, one giant die was in their place. Entertaining at D’Urbevilles put Crandall in touch with some salty characters and he tailored his act to the more blue humored and risqué. One of his funnier non-sequiturs included him unzipping his fly and pulling out a pocket watch to check the time, and then putting the watch back into his crotch to continue the show. His cleaner, yet still guffaw worthy material he saved for on-screen appearances on popular television shows at the time like Jack Paar, Steve Allen, and Garry Moore. When the senator wasn’t tending bar or performing, he stayed busy in front of his typewriter putting his wacky thoughts to paper and published numerous articles, columns, and pamphlets all dealing with magic and conjuring. He was known for his acerbic wit, much of it aimed at sleight of hand purists whose repertoire consisted of dull presentations of playing card mastery. While an adept practitioner of sleight of hand, the senator definitely had a less is more philosophy when it came to performing card magic. He found it more important to entertain an audience than beat them over the head with feats of magic technique. Other less talented and more sensitive magicians took his barbs as cruel dismissals of their talents, not knowing that the “senator” was always “on” and never slipped out of character. His tongue was always planted firmly in cheek. One of the hilarious articles he wrote for his personal newsletter the “senators”’ pink sheet was a tale about himself shopping in the lingerie section of a local department store for a padded bra squishy enough to fit inside one of the cups for the surprise ending at the end of his chop cup routine( a one man version of the famous cup and balls trick) and how the sales women watched in disgust as the perverted old creep in thick black glasses fondled the under garments. In 1967 the senator was diagnosed with a brain tumor after seeking medical treatment for of dizzy spells. While recovering from his operation, Milt Larson Sr., founder of the magic castle, had heard about the senators illness and offered him a job as doorman at the then four year old establishment. The senator had been given a new lease on life and left the bitter cold of Chicago for the sunny climate of Los Angeles, California. La cosa nostra. This short and simple phrase, made famous by the Italian mafia, translates into; this thing of ours. The Magic Castle opened to the world on January, 2 1963 and is a cross between a Freemason’s lodge and the Friars club. Becoming a member is for many magician as close to becoming a made man in the mafia. It’s the top fraternity house for magicians, mind readers, séance practitioners, and other assorted fans of eccentric and bizarre entertainment. Crandall got to Los Angeles in the mid 1960s, when the dress code for southern California could politely be called casual. Then as now the Magic Castle had a strict dress code and Crandall was a stickler for the rules. He had no hesitation about giving the bums rush to any hippie, ne’er do well, or generally uninformed tourist who tried to make their way inside wearing inappropriate attire. Tattered jeans, tie-dyed t-shirts, bikinis, and vulgar amounts of visible flesh were a no-no. When not bouncing slobs, acting as m.c., or tending bar, he would do a weekly Saturday show at 12 p.m., and his reputation spread. Years before the midnight movie craze swept over the independent cinemas of the late 1970’s, the “senator” was using the same carnie tactic to build a cult of loyal fan club members( which included Hollywood icon Cary Grant) who came week after week to see the senator dispense with his quick wit and insults. Not only was it encouraged but it was expected. The show was touted as x-rated and held exclusively at midnight for a more adult crowd. By today’s standards the show was about as clean as Shirley Temple’s criminal record. The humor never got more raunchy than your average episode of Dean Martins celebrity roast or a bawdy burlesque. The senator insulted men, women, and children alike and played the part of the lecherous old king leer to a tee, as he ogled at the pretty gals who can always be found hanging about the castle, slack jawed and amazed at all the wondrous things going on around them. Sadly on June 19, 1975 the quick wit and insults came to an end as the Senator passed away at home with his wife Ruth. The academy of magical arts held a tribute in his honor at the magic castle to one of their most beloved and best known magicians . the world of conjuring would be a duller place for it. For those of you who enjoy packet tricks.. this is a truly simple effect that has step by step instructions on your prediction envelope.. instructions the spectators reads and follows. Everything you need to perform ODD is included and you should be up and running in about the same amount of time it takes to watch the five minute training video. There are also written instructions with pictures that eliminate the need to even watch the video.. although I would recommend both watching and reading all the instructions. ODD is a prediction effect. You begin by laying seven cards side by side in front of you and the spectator.. sitting across the table. You also lay a small coin type envelope, your prediction envelope, on top of one of the cards. The envelope has a set of instructions, ODD instructions, on the up side.. and the spectator simply follows the five steps to eliminate all the cards but one. Each step gives the spectator control over a series of moves. They choose a number.. and follow the directions. Reading the sales copy.. I do agree with all the statements. It is fully examinable and simple to do. It is also self working.. -if- you follow the directions printed on the prediction envelope. This is a nice little effect for walk around, but moreso for close up when you can isolate a spectator in front of you. I cannot recall exactly where I’ve seen this method used.. but I have. I’m sure it’s something I read in an old source, but, it’s been updated and modernized to the point where no one other than a very informed magician would recognize your method. That said.. I do not recommend immediately repeating this effect. There IS a little something that might be caught if you performed it a second time. It’s not a big deal.. and you could probably perform it safely a second time after a little time has passed. Again, everything you need to perform ODD is provided. There is even a second prediction envelope and instructions included.. plus regular Bicycle cards that can be easily replaced should something happen to one. Actually, should you buy ODD.. you might want to switch out all the unused cards for blank cards. Just a thought. Writing a detailed review of a self working packet trick is not easy.. but I think, I hope, I’ve told enough to help you make an informed decision. I appreciate that ODD is self working, despite appearing to be a totally free choice by the spectator. I recommend it to those of you who enjoy sticking a packet in your shirt pocket for that moment when you want to impress a spectator.. or two or three. Available from dealers who carry the Murphy’s Magic line of products..
Catapult your entry into the world of professional speaking! “Magically Speaking” has been compiled by long time professional speaker and magician Timothy Hyde. What should a speaker have in their promotional press kit? Do you know the questions a speaker bureau will ask you if you approach one? What are the 7 keys that will ignite hot interest in booking you? How do you choose a topic? How do you build your career? What is the most powerful question you can ask a potential client? Which speaker ezines are the best to subscribe to? (There are lots out there but we will point out the essential ones.) Should I join the National Speakers Association? What is an elevator speech? And much much more! This Masterclass will point you in the right direction and fast track your growth in this exciting industry. Janus is the card magic of Kevin Casaretto of Salisbury, South Australia.. as told by Paul Lelekis. Kevin compiled this exceptional collection of original effects through years of hard work and recently contacted Paul with the enviable task of putting everything together into an ebook. There are a total of ten effects and all effects use a combination of gaff cards. I understand the reluctance of some magicians to use gaff cards… but that reluctance usually stems from either a lack of familiarity with gaffs on the part of the magician, or, a fear that once the audience knows you used gaffs, your perceived acceptance as a full-fledged magi will be diminished. First.. if you do not use gaffs, you are limited in your repertoire. Yes, there are many effects that do not require gaffs, but, if you do not use gaffs, you will forever be denying yourself an array of effects that are virtually impossible using conventional cards. Second.. Why the heck would the audience know you are using gaffs? Are you planning on dropping the deck? I wish I could tell you the number of current effects.. by internationally known magicians.. that employ gaffs. If a magician has a ‘signature’ effect he refuses to tip… chances are there’s a gaff involved. He is capable of pulling off a seemingly miraculous effect, a reputation builder, with a gaff… and he doesn’t want you to know. Can you blame him? JANUS uses a simple combination of gaffs; double backers, double facers, and red/blue backed cards. Nothing is used that you could not create in a minute or two with regular cards and a roll of double backed tape or rub on and/or white children’s glue. Of course, you can buy gaffs at most magic shops and online.. and they are very affordable. 1) JANUS – A sandwiched transposition! Cards on the table and a card in the deck change places right under the spectators nose..
2) Signed, Sealed, and Delivered – A very simplistic, yet powerful transposition of signed selections! Two signed cards change places in two different envelopes.. and SO simple to perform . 3) 2-Card Monte – The “con game” made easy! Quickly establish your inner cheat with this demonstration of gambling skills. The super easy move is taught in video. 4) Five Colour Twist – The Aces turn face-up and facedown, then their backs change color three times! 5) Magazine Mental Test – A very cool, easy to do, feat of ESP! You’re going to LOVE this ingenious effect! Plus learn a very usable force. 6) Card to Wallet – Signed card flies to wallet and then changes its back color…TWICE! 7) Changing Back – An excellent variation of a Dai Vernon classic of magic! 8) It Can’t Be Done – A very clever “Do As I Do” effect with three phases. 9) One At A Time Aces – Kevin’s own take on a Marlo trick…the Aces travel and then change colour! One of my personal favorites. 10) Turn-Over Cards – A display of 8 cards, turning face up and face down under impossible conditions! Additional video instructions included.. If you have ever wanted to perform a ‘coin in which hand’ type of effect, Gerti Reborn is for you. You have two coins; you ask a spectator to sign one of the coins. You invite the spectator to place one coin in your hand and to place the other coin in one of their own hands. Without looking, not only are you able to reveal which of you has the signed coin, with the updated Gerti Reborn you are now able to tell the spectator which coin they have, as well as in which hand they hold the coin. First.. I’m not sure what ‘Gerti’ means. Maybe it’s just me. I do know that in R.A. Salvatore’s “The Two Swords”, giantess Gerti Orelsdottr, skilled with her sword and with her arcane magic, could bring the power of the elements down upon any who dared stand against her, could blast them with lightning, fire and storms of pelting ice. Maybe she is indicative of the power of the name.. maybe not. The ad copy is correct. There is NO hyperbole and NO exaggeration. Although I’ve not had the pleasure of using Hugo Shelly’s Sixth Sense.. which will instantly tell you which hand holds a coin, Sixth Sense is electronic and over $200. The great thing is you do not have to ask questions.. two questions.. to determine which hand has the coin. That’s worth the cost if you’re in a position where you can justify the cost. Gerti Reborn, in performance, is very similar to Tequila Hustler ( Mark Elsdon, Peter Turner, Colin McLeod and Michael Murray). After the coin is concealed by the spectator, two questions are asked and the performer knows the position of the coin. Gerti uses two coins, one marked and one not marked, and after you and the spectator both conceal a coin each..(the spectator is in control).. you asked essentially the same questions as with Tequila Hustler, and you instantly know not only whether the spectators coin is marked or not.. but in which hand they are concealing the coin. It’s sort of double the bang for your bucks. Gerti Reborn, though, uses an entirely different method than the Tequila Hustler. I can’t say much more without giving away too much.. other than to say a gimmick is used. Half the time the spectator them self will hold the gimmick for you.. and not realize it. There is a very slight chance the gimmick could be discovered, but very unlikely. This is addressed in the video training and should not be considered a deal breaker. The instructional video is taught by Costas from Magic Tao and covers all the bases. Also, there are US, Euro and UK versions of the gimmick available. If you live outside these countries I would check with the dealer before making a purchase. I like it.. I will recommend it to anyone who appreciates the subtle deconstruction of determining ‘which hand’ conceals an object. In the right hands, and with the proper patter, you’ll have a solid effect that’s perfect for restaurants and walk around. $25.00 from magic dealers who carry the Murphy’s Magic line of products. THE Ultimate 4-way-out envelope.. Imagine an ingenious envelope that will deliver the correct prediction, no matter which of 4 possible outcomes occurs! YOU ARE COVERED! I see many magic products. I get to handle, first-hand, many different creations. Switch-A-Lope by Arnaud is one of my favorite reviews as, although it is slightly higher priced than most products I review, it performs exactly as describes. Since it is designed for parlour and stage, not close up, the price is not only justified, but extremely affordable. In a time when quality props are often hundreds, if not thousands, of dollars, Switch-A-Lope is a steal. When I say.. ‘develop your routine’.. I mean it. You are taught all the essentials on a 14 minute, password protected, video. Essentials is a polite word for ‘handling’. The routining is all yours, and I’m fine with that. Besides.. my wife insist I use my head for something other than a hat rack..
Not everyone reading this review will be interested. Since it’s used primarily by mentalists, in mental magic, and by performers who work in considerable space; those who ARE interested should be VERY interested. A small orange envelope is contained in a large white envelope, visible at all times through a window. At the appropriate moment, the magi, OR THE SPECTATOR, can remove the inner envelope and reveal any of four different outcomes. It’s really as simple as that. The envelope can be fully visible from the beginning of the effect and the performer does not have to touch the envelope at any time during the effect. Yes, there are other envelopes out there, but I am not familiar with one that performs so admirably. A friend brought one to our last magic meeting.. and left with almost everyone, whether they could actually use one or not, wanting one. That is perhaps my strongest recommendation – I’ve seen the glimmer in their eyes and the covetousness in their heart when presented the opportunity to handle Switch-A-Lope. It has my total recommendation, and will have you awake at nights devising new uses for this very creative magical tool. The effect… any card at any number – a trick that needs no introduction (or does it?). “A deck of cards is presented. participant is asked to freely name ANY card and ANY number (between 1 and 52). after a single cut, the cards are handed to the participant, who then deals-down to their chosen number to find – despite the odds – their chosen card at their chosen position. It’s as strong as it gets in terms of card trick plots, and is considered by many to be the holy-grail of card magic. Still the best resource on the web for magic for children. Lots of videos and articles. Again, Congrats on winning AGT and the One Million dollar grand prize! Rich Ferguson teaches ten practical forces. You can’t perform successful card magic without the ability to force a card… and every magician of note has their favorite method. Some of these forces are Rich’s own methods, and I think you’ll enjoy this video. 13 minutes long..
Any coin trick master can be observed rolling a coin down their fingers from the index to the pinky and back again. It’s often referred to as knuckle rolling or the Steeplechase Flourish. You may have seen this trick performed by various “cool” movie characters on the big screen. Although this trick may seem hard to perform, it doesn’t require that much skill. With some dedicated practice and various sized coins, even you can learn this impressive trick. This is the sixth PDF in a series of ten. First, you’ll find 36 pages full of effects from wonderful contributors. Secondly, you’ll find 50 different effects that cover a wide variety of styles. These are all effects featured in the Magic Roadshow through the years. I REALLY think you’ll enjoy this..! Gregory Wilson is a thief. Most magicians know Gregory from the many original effects he has created that are in the working repertoire of professional close-up magicians around the world. Many know him from his long running column in MAGIC Magazine on Coffee House Conjuring. And many have seen his lectures on Penguin or perhaps live in their own cities or at magic conventions. But most are not aware that Gregory performs a professional full evening show as a pickpocket and mentalist. In the first half of the show, he steals watches, wallets, belts and eyeglasses and in the second half performs mind reading to the amusement and amazement of all, both his audience and his victims, er, uh, I mean, volunteers. Gregory starts off this podcast with a great idea for magicians to try if they are stopped for speeding. He talks about a video he took with his iPhone and posted it on his Facebook page which is posted in this blog above. Gregory also talks about his professional pickpocket show. The discussion was intended to eventually talk about Wizard Wars and some of the “behind the scenes” stories in the production of the TV series; however, for some reason we “went off the rails” and diverted our discussion to talk about something that he has not ever made public: the assertions that he has stolen ideas/tricks/moves from other people. In private, Gregory is outspoken and has strong views. In this podcast, he finally lets go something that’s been bottled up since 2001. “Netflix dives head first into the “pick a card any card game” with their new reality show Magic For Humans. Now streaming on Netflix, the six-episode series follows affable comedian/magician Justin Willman as he performs an array of elaborate, good-natured magic tricks for a slew of baffled strangers. The Gist: The tagline for Magic For Humans is “Real people, real magic, no camera tricks.” I can’t attest to the legitimacy of Willman’s illusions, but I can say that the show’s combination of elaborate experiments and man-on-the-street magic is a blast. The pilot episode explores the concept of self-control. Willman conducts his own version of the famous “Marshmallow Test,” a study on delayed gratification in which a child’s offered one marshmallow now or two later, with a group of children that’s equal parts hilarious and adorable. The episode also uses magic to help debate fate vs. free, while also delivering some truly unbelievable man-on-the-street magic. The coup de grâce? The episode ends with levitating goat yoga, which, honestly, is my favorite kind of yoga. Our Take: Magic For Humans is different than most magic shows. Host Justin Willman, who you may recognize from Cupcake Wars, King of Cones, or Win, Lose, or Draw, is more relatable than most magicians. Instead of relying on an enigmatic personality, Willman is cheerfully disarming as he shocks and awes unsuspecting bystanders with unimaginable feats of sorcery. The kids from Willman’s marshmallow experiment provide some of the funniest reactions, but even adults can’t help but get swept away in the dazzling spectacle of intrigue. Breakout Star: Justin Willman. The Magic For Humans host is charisma personified. Even if you’re immune to the perplexing awe of magic and wonder, you’ll enjoy Willman’s awe-shucks charm and breezy, conversational humor. Our Call: Stream it! Magic For Humans is a pure delight. While many magicians possess a smug, off-putting bravado, Willman’s distinct brand of cozy magic is all-inclusive. Magic For Humans is a fun, entertaining series that’ll make your bad day disappear. Proud to announce the premiere of another one of our @Netflix original magic series starring @DMCmagic! #DeathByMagic streams worldwide Nov 30th!! As it says.. it’s a compilation of folks acheving the impossible. Impossible shots.. impossible feats.. just impossible. Yes, it’s football season again.. my favorite time of the year. I dislike some of the ‘shenanigans’ as much as the next guy.. but it doesn’t stop me from watching. I’m not going to allow the actions of a very few to distract from my enjoyment. That said… I’m inviting you to join an online football pool. There’s no cost, and signing up is simple. We employ the straight pick ’em format (win/lose) instead of the point spread to keep things simple. Navigate to the following link to register with the pool named ‘Magic Roadshow’.